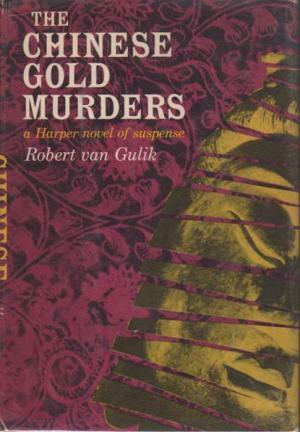 Robert van Gulik (1910-1967) was a Dutch diplomat who had a very successful parallel career as a writer of the Judge Dee mystery novels. His career as a mystery writer began in the late 1940s with his translation into English (under the title Celebrated Cases of Judge Dee) of the 18th century Chinese detective novel Dee Goong An. Van Gulik felt that Judge Dee was a character with great potential and he tried his hand at writing an original Judge Dee detective novel, The Chinese Maze Murders. Many more were to follow. The third of his original Judge Dee mysteries was The Chinese Gold Murders, published in 1959. Van Gulik wrote his novels in English. The early Judge Dee novels appeared first in Chinese and Japanese translations but it soon became apparent that the more sensible approach was to publish the English language versions first. Van Gulik’s idea was to retain as many of the features of the traditional Chinese detective novels (or gong'an) as possible, but presented in a way that would make them more accessible to modern readers. Judge Dee always has three cases that he must solve simultaneously. There are hints of the supernatural but these are toned down considerably. (although not eliminated altogether). The Judge Dee stories are set in the seventh century AD during the Tang dynasty but as in the Dee Goong An much of the detail is representative of later eras. Judge Dee is a magistrate but his duties go beyond judging cases. He is also in charge of the investigation of crimes. He’s like a judge, a District Attorney and a police officer all at once. The Chinese Gold Murders deals with three early cases that Judge Dee deals with after his appointment as magistrate of the town of Peng-lai. The first and most urgent case is to solve the murder of his predecessor in the magistrate’s post, who was poisoned although there seems to be have been no possible way that the poisoning could have taken place. This certainly qualifies as an impossible crime story. He also must discover the whereabouts of a missing bride, and the whereabouts of his own chief clerk, as well as solving the puzzle of the body of a dead Buddhist monk. There’s another murder as well plus there’s a man-eating tiger to worry about. Not to mention the possibility of a major smuggling ring. And what is a Korean prostitute doing in possession of official court papers? As always Dee can rely on the services of the indefatigable Sergeant Hoong and in this novel he acquires two very useful assistants, both former highwaymen. The idea of three mysteries running in parallel works quite well and adds a touch of realism. Unlike 20th century amateur detectives a district magistrate like Judge Dee would not have the luxury of being able to concentrate all of his attentions on a single case. There are also possible links between the three main cases. The solutions to some of the puzzles were apparently drawn from the extensive Chinese detective literature so if the explanation for the impossible murder might seem a little far-fetched that’s not Van Gulik’s fault. And the murder method is just about plausible, and it’s certainly ingenious. The Chinese setting is fascinating and while the details are not always authentically of the Tang Dynasty Van Gulik did have an extensive knowledge of Chinese jurisprudence so those details can be assumed to be basically correct. Dee’s techniques are those you expect from a western detective - common sense, observation, interviews with suspects, examinations of the scenes of the crimes, considerations of motives and logical reasoning but they’re combined with a couple of novel methods. Judge Dee is prepared to accept hints with a supernatural (or possibly supernatural) source and he’s also willing to employ torture, torture being regarded during the Imperial period in China as a perfectly legitimate means of obtaining information. Torture was also considered to be essential for procuring a confession, it being impossible to convict someone of a crime without a confession. The idea of a fair-play mystery was of course quite unknown in traditional Chinese detective fiction. Since that’s the feel Van Gulik is aiming for it’s hardly reasonable to complain if the story does not conform to more modern notions of fair play. The Chinese Gold Murders is wonderfully entertaining. Highly recommended. 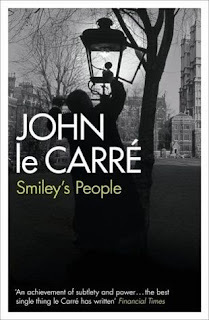 Smiley’s People is the concluding volume in John le Carré’s Karla trilogy. It appeared in 1979. George Smiley has now retired and this time he expects his retirement to be final. And it would have been, if only Vladimir hadn’t managed to get himself killed. Vladimir, otherwise known as The General, had been one of the Circus’s best agents. That was a long time ago. He has long been inactive and the Circus had just about forgotten his existence. What’s disturbing about Vladimir’s death is that just before he died he had telephoned the Circus, demanding an immediate meeting with Smiley (of course the old boy had no way of knowing that Smiley had retired). Now the Circus wants Smiley to clear up the loose ends of the case. What they mean by this is that they want the whole thing buried. They don’t want anything to be found that might link Vladimir to the Circus. They want a cover-up. Since it’s a cover-up they want it may have been unwise to ask Smiley to take care of it. Smiley is a man who still takes the business of espionage very seriously. They should have realised that if he found anything worth following up he’d follow it up. And he finds quite a few things worth following up. Like the way Vladimir was killed, by a method used only by the Soviet intelligence services. The General had really been on to something. Something big. There have been big changes at the Circus. As Toby Esterhase (now also in retirement) puts it, the Circus has now joined the Boy Scouts. They are no longer allowed to use any of the techniques of actual espionage. With Saul Enderby now in charge the Circus is merely a political tool and it’s a tool in the hands of a government that wants an intelligence agency that costs nothing to run and doesn’t make waves. One of the things the Circus is no longer permitted to do is to make use of émigrés like Vladimir. They’re yesterday’s men, men who think the Cold War is still going on. Smiley is a yesterday’s man as well. There is one problem. An ageing superannuated ex-spy he may be but George Smiley is still the the best man in the business and now he has found a scent and he intends to pursue it, wherever it may lead. The yesterday’s man theme is one that seemed to fascinate le Carré. The Looking-Glass War deals with a British intelligence agency composed of World War 2 heroes who have never adapted to the new post-war world. In Smiley’s People it’s Cold War spies who can’t adapt to a world in which the Cold War is winding down. This obsession gives le Carré’s spy fiction much of its distinctive tragicomic tone. This novels falls into two quite distinct halves. The first charts the course of Smiley’s investigation. It’s essentially a detective story with Smiley playing the role of private detective, the Circus having no knowledge of what he’s up to. The second half follows the course of Smiley’s operation, a semi-official undertaking by a whole bunch of yesterday’s men. Smiley is now the hunter. In The Looking-Glass War the yesterday’s men are bumbling incompetents but in Smiley’s People they’re the old school professionals contrasted with the inept new men. One very odd thing about le Carré is that although he could never be described as an upbeat writer his 70s spy fiction strikes me as being slightly less defeatist than his 60s work. This is very odd since it’s also obvious that he’d become even more cynical about government and the uses to which intelligence agencies were put by government. Perhaps he had at the same time become marginally less cynical about human nature. Karla has always been like a sinister inhuman force lurking in the background. In Smiley’s People he finally takes on a human face, much to George Smiley’s consternation. Could the great Karla actually suffer from human weaknesses? This is a fine conclusion to the Karla trilogy, and to the George Smiley saga (although I believe he makes cameo appearances in a couple of later novels). Highly recommended. The 1982 BBC TV adaptation is worth seeing. Samuel Hopkins Adams (1871-1958) was a colourful American muckraking journalist who also wrote successful fiction in a number of genres, including detective stories. 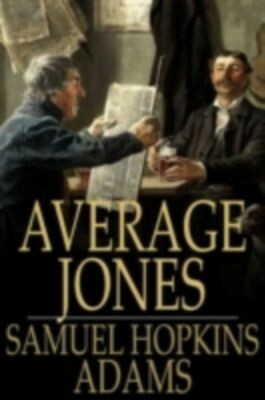 His most notable effort in the latter category was his 1911 short story collection Average Jones. The hero of these stories is actually a wealthy young man by the name of A.V.R.E. Jones who has inevitably acquired the nickname Average Jones. Like many young men in his position his otherwise comfortable life is marred by one great affliction. He is bored. He is an intelligent man who has never found anything that has really captured his interest. One day as he is taking at ease in his New York club his newspaper proprietor friend Waldemar suggests that he should consider becoming a crank. This is in his view virtually a guarantee of a happy and contented life. He points to the example of an acquaintance who collects scarab beetles and another who collects medieval musical instruments. Their hobby-horses give them unending pleasure and intellectual stimulation. Waldemar even has a hobby-horse in mind for his young friend. He has often thought that an obsession with curious and/or fraudulent advertising could prove to be a satisfying and possibly even remunerative career. Jones is bored enough to act on Waldemar’s suggestion. He sets himself up in an opulent office and embarks on his new career as New York’s resident expert on peculiar advertisements. This will lead him into a second unexpected career, as an amateur detective. Perhaps not entirely unexpected - it stands to reason that behind an eccentric or bogus advertisement it’s quite likely there will be a crime. Waldemar has shown shrewd judgment in choosing a hobby for Jones. For a young man being rich, intelligent and easily bored can be a dangerous combination and could easily lead him into a life of dissipation and viciousness. What Jones needs is an occupation that will offer both mental stimulation and the ability to do some good in the world, and to feel that he is doing something worthwhile. Jones has a bit of a personal motivation as well. His wealth comes from an inheritance from his uncle, a notoriously corrupt and grasping businessman. The old man used his will as his final means of expressing his contempt for humanity. The will leaves his entire vast fortune to Jones on the condition that he must complete five years’ continual residence in new York City. The old man reasons that five years in New York will be enough to corrupt the morals of any man and he is confident that his nephew will subsequently squander his fortune. Jones is an easy-going fellow but he does like the idea of proving his uncle wrong by not making a mess of his life. The newspaperman Waldemar is a kind of ideal self-portrait of the author - they are both men who make a good living from muckraking journalism but also have a genuine zeal for exposing corruption and sharp practice. Waldemar clearly hopes that Jones will absorb at least a little of that same zeal from his new hobby. These stories were published in 1911 and therefore pre-date the age of the fair-play detective story. In this earlier era the rules of the game were simpler but there were still some rules, these being essentially that however outlandish the plot it should have at least some tenuous plausibility and more importantly that the reader should feel that the detective really could have solved the puzzle based on the clues available to him. Adams adheres to these rules quite faithfully. The B-flat Trombone introduces us to our detective. His first case comes about by accident. An odd and rather bizarre crime stirs a memory in Jones, a memory of one of the first eccentric advertisements that came to his attention. There has to be a connection and he is determined to find that connection, between an advertisement seeking a trombone player and an explosion which propels a crooked politician from a third floor window. It’s a complicated but extremely clever crime, the main weakness of the story being that the reader is almost certain to see the connection before the detective does. The ingenuity of the idea is still admirable and the story is very entertaining. The Red Dot is even more ingenious but this time the reader will find himself facing a tougher challenge. In fact in this case the clues that lead Jones to the solution are all clearly laid out. The outrageousness of the plot is an absolute delight. It starts with a young chemist whose dogs have been poisoned but not with any of the more commonly encountered poisons. Other dogs have met similar fates elsewhere in the country. Dogs aren’t the only animals involved - moths also lay a part in the story. Much suffering might have been averted but for the weather. Open Trail isn’t particularly challenging as a mystery but there is high adventure that takes Jones to the wilds of Baja California. Gold mines can be lucrative but there’s even more money in water, in the right circumstances. Quite an entertaining tale. In The Mercy Sign a young scientific assistant disappears. A cardboard box with the label Mercy is the chief clue that helps Jones avert a diplomatic incident. This is a classic example of the sort of outrageous plotting that was popular in detective stories of this era and it’s great fun. The Blue Fires of the story of the same name are stones. Not very precious stones but a couple’s happiness depends on them and they have been stolen. Bed knobs, torn curtains and milk vendors play key roles in this case. The solution is very far-fetched but it’s fun. Pin-Pricks is a story of persecution. A man has no idea why anyone would want to persecute him, and in such a strange way, by means of coded messages using pin-pricks in old advertising material. Codes of some kind were a staple of pre-golden age detective fiction but Adams finds a new twist. In this story Average Jones discovers that it is possible to be a professional stamp eraser. A basic knowledge of fishing is also always useful to a detective. Big Print tells the story of the celebrated Harwick Meteor, and the disappearance of a young boy. Objects falling from outer space might not seem to have an obvious connection with vanishing 14-year-old boys but remember that Jones has that theory that detective work is all about seeing patterns in apparent coincidences. This is a charmingly over-the-top romp. The Man Who Spoke Latin is a very quirky tale. Lots of people speak Latin but in early 20th century New York it’s decidedly unusual to encounter a man who speaks no other language but Latin. Even more unusual is that he claims to be the only man who speaks Latin with the correct accent of Cicero’s day. It’s enough to arouse our detective’s curiosity. It’s a story that could almost have been too offbeat for its own good but it works. The One Best Bet throws Jones into the middle of a struggle between a reforming politician and a gambling boss and Jones finds that photography can be a deadly pastime. Not one of the stronger stories in the collection. The Million-Dollar Dog involves a very wealthy dog, an heiress, a crooked judge and several hundred small black beetles. Average Jones is an engaging detective hero. He might be wealthy, well-educated and cultivated but he lacks the extreme affectations of a Lord Peter Wimsey or a Philo Vance. He feels no need to bludgeon others into admiration of his obvious intelligence. He does have one amusing quirk - you can tell that his mind is working at top speed when he starts to speak even more slowly than usual. Jones also has his own theory of detection which is that the successful detective is a man who has the ability to discern a pattern in what would appear to be others to be merely a chain of curious coincidences. Curious advertisements provide more than just clues in these tales - the advertising columns are also among the chief tools employed by Jones in gathering his evidence. Adams has a bit of an axe to grind in regard to political corruption but unlike so many politically motivated writers he never lets this get in the way of telling a good and clever story. This is a strong collection of consistently interesting stories with an emphasis on quirkiness and a somewhat tongue-in-cheek flavour. Highly recommended. Edmond Hamilton (1904-1977) was an American science fiction writer. He was married to fellow science fiction writer Leigh Brackett. 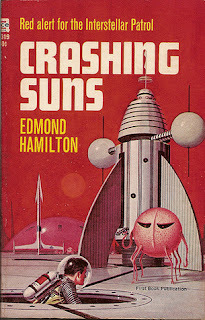 Crashing Suns, published in 1965, is a collection of some of his very early work in the genre dating back to the 1920s. It has to be emphasised that this is very very early space opera. In fact in some ways these stories mark a transitional phase between the scientific romances of the late Victorian era and the space opera of the early part of the “golden age” of science fiction. These stories recount the adventures of the Interplanetary Patrol, later renamed the Interstellar Patrol. They are very much space opera in general theme but they take place in a very different universe compared that to the universes we find in later space opera. In the late 1920s it still seemed quite possible that planets such as Saturn and Jupiter would be habitable. The nature of the great gas giants was as yet not generally understood. These are also stories that still assume that the vast reaches of outer space are not vacuum but are filled by that mysterious substance known as the æther. Light was believed to be propagated by means of waves in the æther. In actual fact the æther theory had been pretty much abandoned by the 1920s, having been rendered unnecessary by relativity. At least it had been abandoned by physicists but to non-scientists like Hamilton relativity was still new-fangled esoteric stuff. Hamilton understood that faster-than-light travel was a problem but his understanding of the problem was rather primitive. My impression also is that despite his love for epic scale Hamilton really could not conceive of the ramifications of the vastness of interstellar space. Most of the science in these stories is completely fanciful and would not have been wildly out of place in the works of Wells and Verne. For some readers this might be a problem. For me it just adds to the charm and the fun. This is Flash Gordon stuff but I happen to love Flash Gordon and Buck Rogers. The best way to enjoy these stories is to pretend that they take place in an alternative universe in which all the laws of physics are different. It’s easy enough to accept magic in a fantasy story so it’s really not that much of a problem. And I rather like the idea of a universe that works in a late Victorian manner. The novella Crashing Suns, one of Hamilton’s most famous works, first appeared in 1928. It takes place a hundred thousand years in the future and it can’t be accused of lacking ambition. A dying red giant star is on a collision course with our sun! Mankind has only just developed the technology to achieve interstellar travel. A brilliant young scientist has designed an interstellar drive which creates its own waves in the æther which the spaceship then rides. Young Interplanetary Patrol cruiser captain Jan Tor is put in command. His mission is to reach the dying red star and find a way to stop it! This story has delightfully goofy science, high adventure and an epic space battle. Most of all though it has sweeping scale. This is pure pulp space opera and it’s terrific fun. The Star Stealers is on an equally gigantic scale. Aliens are trying to steal our sun! There are might space battles and lots of breathless excitement and you have to love the idea of an inhabited sun, with cities on it. Within the Nebula concerns another threat to the galaxy. The vast nebula at the centre of the Milky war has started to spin. If it keeps spinning it will fly apart, ending death and destruction to all the worlds of the Federation. A new star cruiser, designed to withstand intense heat, is dispatched to discover the cause of this impending disaster. The three crew members, of three different species, penetrate into the heart of the nebula itself. Inside they find a strange world and the source of the menace but it seems they may be powerless to avert the coming catastrophe. The Comet Drivers presents yet another deadly menace to the galaxy - a gigantic vampire comet! As the story title suggests this comet does not follow a random orbit - it is controlled by some form of intelligent life. Intelligent but distinctly unfriendly. The Cosmic Cloud presents the interstellar civilisation with yet another horrific threat - a gigantic cloud of darkness at the centre of the galaxy. This is a region of absolute utter darkness. There is no light at all. Not a glimmer. Of course it’s impossible that any kind of intelligent life could survive under such conditions. Or is it? This world of darkness is one of Hamilton’s most unsettling concepts. Hamilton’s style is pure pulp. There is absolutely zero characterisation. It’s all action and all on the vastest scale and the breadth of imagination is nothing if not impressive. As you may have gathered by now these five stories are all variations on a single theme. A massive heavenly body of some kind is about to destroy the galaxy, there are malevolent aliens directing these events, these aliens are entirely evil with no redeeming qualities whatsoever, the heroes are captured and must escape, there is a race against time and there is at least one huge space battle. It’s a formula that was working for Hamilton at the time and he stuck to it quite rigidly. It’s interesting to contrast Hamilton’s early work with the early work of his wife Leigh Brackett (here’s the link to my review of some of her early stories). Brackett was interested in the fate of individuals. Hamilton is interested solely in the fate of galaxies. Brackett was fascinated by the past, by ancient civilisations. Hamilton writes about a 200,000-year-old civilisation but he tells us not one single thing about its history. In fact he tells us very little of any kind about this civilisation. Of course these tales were written by Hamilton when he was in his mid-twenties. He may have developed a much greater sophistication in his later books. These stories did however establish him as a writer of space opera. His faults, like his stories, are on the grand scale. Those faults are balanced by real strengths - breathless pacing and non-stop excitement. Their pulpiness makes E.E. Doc Smith seem subtle and polished. But they are fun and the odd late Victorian scientific concepts give them a distinctive flavour. The quality of the five stories, written between 1928 and 1930, is quite consistent. All are fun in their own way. Recommended, especially if your tastes run to early space opera and you have no problems with wildly unrealistic science.